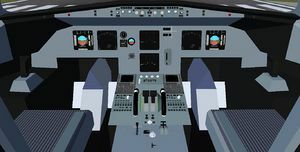 For the newer A320 Series from the it0uchpods Design Group, see IDG-A32X. The Airbus A320 Family is a series of narrow-body commercial passenger jets manufactured by Airbus Industries. Designed for short to medium hauls, the aircraft pioneer fly-by-wire technology and regularly compete with the Boeing 737 series. 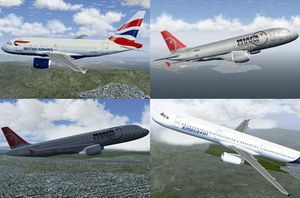 The series includes the Airbus A318, the A319, the A320, and the A321. The "A320 Enhanced" program aims to further improve the A320 family with longer range and better fuel economy. 1. Start the APU. APU starter ON and APU master switch ON. 2. APU electric generator ON. 3. Engine start knob START. 4. (Wait a couple seconds...) Engine cutoff switches RUN. 5. Engine 1 and engine 2 electric generators ON. APU electric generator OFF. 6. APU starter and master switch off. Engine start knob OFF. This page was last modified on 9 February 2019, at 18:50.